In our online records series we are looking at the websites of the city archives of the three largest Dutch cities. We have visited the the city archives of Amsterdam and Rotterdam, and today we will go to The Hague. The Virtuele studiezaal (virtual study room), also known as Burgerlijke stand online (civil register online), is the online database of the city archive of The Hague. The BMD records of the civil register of The Hague. The city archive has scanned, but not indexed, the civil register of The Hague, so it is not possible to search the register, at least not in the way you can search other online databases. Users of the database can index the records they find, and by now many records are indexed, but there are also many unindexed records. To search the indexed records, click the button labelled Zoeken in beschreven documenten (search in described documents), on the right. Fill in Achternaam (surname), and, if necessary, voornamen (given names), tussenvoegsel (infix), or datum document (date of document, in the order day-month-year). Click the Zoeken button to start your search. Click on a name to view the scan. Searching records that are not indexed yet is more complicated. If you have searched for Dutch BMD acts in a Dutch archive or in a FHC before, The search procedure will be familiar to you, otherwise the search can be quite confusing. First you have to find the act in a contemporary index. Click on the Zoeken via toegang button on the left. Fill in Naam (zonder voorvoegsel) (name, without infix), and periode in jaren (year from/to). You can limit your search to tafel geboorten (birth index), tafel huwelijk en echtscheiding (marriage and divorce index), or tafel overlijden (death index). Select alle bronnen to search all the indexes at once. 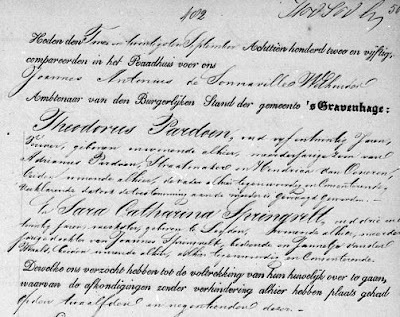 Warning: The Hague marriage acts from 1853 are only indexed on the grooms' names! Fill in the form and click the Zoeken button to search. We find five results. Acts are usually indexed per ten years, but The Hague marriage acts have a single index for the years 1811-1852. The first result is the index to marriage acts for names starting with P-Q. The second result looks similar, but is actually the index to divorces 1811-1852. The third and fourth result are for Loosduinen, a former independent town that is now part of The Hague. The fifth result is the marriage index 1853-1862 for names in the range mage-raimo. We need either the first result, or the fifth. Let's try the first result: Click on p - q. We now have a page of numbered buttons, Afb.1 to Afb.33. The buttons lead to images of the index: From names starting with Paa on the first image, to names starting with Qui on the last. Browse through the images until you find Pardoen (see below how to view and browse through the images). The third image is the one we need: It lists Pardoen, Theodorus; Springvelt, Sara Catharina; 22.9.1852; nr. 482. 22.9.1852 is the date of the act. For marriages, the date of the act will normally be the date of the wedding (there are exceptions), for births and deaths the act is often created a few days later. 482 is the act number. We need the date and act number to find the act itself. On the top of the page there is a search form to find the act we are after. Fill in the date of the act (in this case, 22 september 1852) and click the button Document zoeken. We get a screen full of numbered buttons again. Each button leads to scans of 1852 marriage acts, from 15 September on the first to 10 November on the last button. Browse through the scans until you find the marriage act (in this case, image 8). When you have clicked one of the numbered buttons to get to the scans, you probably have to browse a few pages to find the scan you were looking for. You can use the browser's back button and click another numbered button, but there are also previous and next buttons. The previous button is labelled Vorige, the next button Volgende. You find these just above the scan. On the top left of the page you find a miniature of the numbered buttons (but without the numbers), you can also use these to navigate. On the top of the scan you find a few small buttons. The two zoom buttons are obvious. The button to the right of the zoom buttons is probably the most important button: It opens the scan in a new window, where you can see more of the scan (by default, you only see a small fragment of the scan. Use the double arrow buttons to the right of the scan to scroll up and down, and the double arrow buttons below the scan to scroll left and right. There are plans to scan the population register in the near future. I could not find a public statement about long term plans. 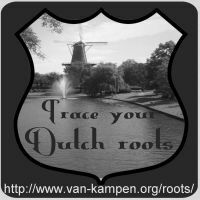 Where Rotterdam has no scans available online, and Amsterdam charges for scans, The Hague has offered scans of the complete civil register online for free. The site, however, is hard to use. The user interface is clumsy, navigation is hard, browsing and viewing scans is not intuitive, there is no proper index, there is no English user interface. The scans are there, but not everyone will manage to find them. The site has two names (Burgerlijke Stand Online and Virtuele Studiezaal) and a URL that is impossible to remember. My impression is that the scans were just dumped onto the internet without much thought about how people might use them. The scans are available, but the city archive really should rewrite their user interface to make the scans accessible. What a great site managed to find the births and marriage of my grandparents and the deaths of my great grandparents. Took me a while to sort out the site as my dutch is minimal. I'm so thrilled at what I found. Will have another look to see if I can get any further back.